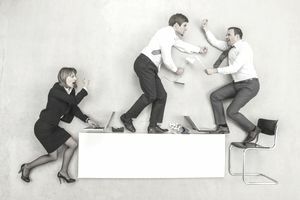 A conflict of interest arises in the workplace when an employee has competing interests or loyalties that either is or potentially can be, at odds with each other. An example is a manager who was promoted from a coworker job where he worked with his wife. The promotion made him his wife's boss so the company, after discussion with the couple and HR, transferred her to another department. A conflict of interest causes an employee to experience a struggle between diverging interests, points of view, or allegiances. Conflicts of interest are generally forbidden in company codes of conduct and/or employee handbooks. Conflicts of interest can cause an employee to act out of interests that are divergent from those of his or her employer or co-workers. In workplaces, employees want to avoid any behavior or choices that could potentially signal a conflict of interest. They are bad news for the employee's reputation, integrity, and trustworthiness in the eyes of management. Conflicts of interest are difficult to describe in a definition, so the following additional examples will illuminate the range of behaviors and actions that can fall within the definition of conflicts of interest. They are as diverse as the work settings in which they occur and involve people interaction, employee actions, and personal benefits taking precedence over what is in the best interests of the employer. These examples should serve as a guide to behaviors that you want to avoid as a person of integrity in your workplace. These are examples of situations in which an employee might experience a conflict of interest. They illuminate the true nature of what a conflict of interest really means. A relative or close friend reports to a supervisor who affects their job responsibilities, salary, and promotions. A male manager dates a female employee who reports to him or vice versa. A lawyer represents a client in a civil dispute while accepting fees from litigants who hold the opposing point of view. A purchasing agent hires his brother-in-law to provide vending services to the company lunch areas. An employee starts a company that provides similar services to similar clients as those of her full-time employer. This is especially conflict of interest when an employer has had her sign a non-compete agreement. An employee who is a member of a company employee selection team fails to disclose that he is related to a job candidate whom the company team is considering for a position. A manager provides paid consulting services on the weekend to a company customer or supplier. An employee works part-time in the evening for a company that makes a product that competes with the products of his full-time employer. A member of the company board of directors accepts fees and provides advice to a company that is in direct competition with the company on whose board of directors he sits. An HR director decides to investigate a formal charge of sexual harassment, using internal resources that she controls, against a fellow corporate executive whom she has known and worked with professionally for years. This would not constitute a conflict of interest if she hired an external employment law firm to conduct the investigation and recommend disciplinary measures. A purchasing agent accepts trips and gifts from a vendor and then selects the vendor's products for purchase by the company. An employee accepts free gifts and free products from a training and development company and then recommends the purchase of these products without comparing them to comparable products from other vendors. A CFO negotiates an agreement in his employer's best interests for a stock option plan from which he will directly benefit. A trainer is paid to provide training classes that teach customers how to use the company's software products. He puts up a website that offers his same training on the products as a for-profit enterprise in his spare time. Why would he ever again direct customers needing training to his company's classes? The manager of a marketing department dated a coworker who is also a manager in the same department. They part ways over time, but when he is promoted to the marketing department director role, she found herself reporting to him. The company was forced to change the reporting chain of the department she managed even though the manager and director were no longer dating. The existence of the former relationship created a potential conflict of interest especially in the eyes of coworkers. An employee sets up a personal website on which he sells his employer's software products.